Really nice and well kept hotel. Good continental breakfast included and lots of things to do within walking distance. My only complaint is that the coffee maker in the lobby did not work and there isn't a coffee pot in the rooms. Where to find Pasco hotels near an airport? Where can I find hotels in Pasco that are near tourist attractions? If you are planning on visiting Tri-Cities and are after an affordable place to lay your head in Pasco, you'll be delighted to find a wide range of accommodation possibilities with Expedia. You can choose from 13 places to stay within a short driving distance of the center of Pasco which are part of Expedia's large network. Stay close to downtown Pasco. 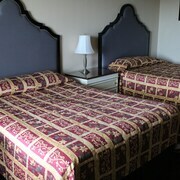 Hotels here include Best Western Plus Pasco Inn & Suites and Red Lion Hotel Pasco. 4 kilometres (2 miles) away from the middle of Pasco is the King City Knights Inn/Pasco WA. This hotel is a an excellent option for tourists who are looking for economical options. The Loyalty Inn Pasco is an alternative no-frills place to stay in this region. You could also check out the Towneplace Suites Richland Columbia Point and the Courtyard by Marriott Richland - Columbia Point. 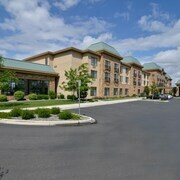 The Towneplace Suites Richland Columbia Point is situated 13 kilometres (8 miles) away from the main part of Pasco. 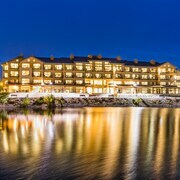 The Courtyard by Marriott Richland - Columbia Point, is 13 kilometres (8 miles) away. Other accommodation options in the area are the Holiday Inn Express Hotel & Suites Pasco-Tri Cities and the Holiday Inn Express & Suites Richland. Why don't you see some more of the mountains to be found in Eastern Washington? Choose to spend time in other parts of Eastern Washington. You can visit local various attractions or go rock climbing, hiking and shore fishing and afterwards book a comfortable hotel. Looking for more to do? Spend the day enjoying Columbia Center Mall and Cable Bridge, in Kennewick, 3 kilometres (2 miles) to the southwest of Pasco. Kennewick accommodation options include the Econo Lodge and Rodeway Inn. Alternatively, you could stay in Richland, 15 kilometres (9 miles) to the west of Pasco, where you can choose from the Hampton Inn Richland/Tri-Cities and Red Lion Richland Hanford House. The Bookwalter Winery and Tagaris Winery are a couple of the popular points of interest to check out when you're in Richland. Look up our current Pasco travel listings and discover the fascinating scenic and cultural attractions this area has in store. What are the most popular Pasco hotels? Are there hotels in other cities near Pasco? What other types of accommodations are available in Pasco? Explore Pasco with Expedia.ca’s Travel Guides to find the best flights, cars, holiday packages and more!